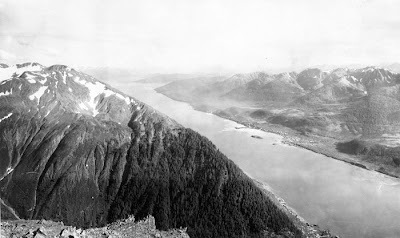 Top of Mount Juneau, looking toward the Treadwell Gold Mine and the Gastineau Channel; U.S. Geological Survey Photographic Library, circa 1906. Top of Mount Juneau, looking toward Douglas and the Gastineau Channel; Aug. 5, 2008. Sometimes, we I feel like I'm approaching a threshold of change, I like to step back and think about the things that don't change. There must be something comforting living in a place that changes so little in over 100 years. The town I grew up in has changed so much since I was born 30 years ago that I don't really recognize much of it anymore. None of my childhood memories fit the town at all. The archivist in me loves thinking about change in this way. The mountains have not changed..
Juneau on the other hand is a slave to tourism. Look at all of the cruise ships. Four ships in this picture alone. It's funny you should mention/display those USGS photos. I just mentioned the USGS photo archive in my last post on my blog, Creative Liberty: http://creativeliberty.wordpress.com/2008/09/03/surf%E2%80%99s-up-creativity-links-for-september-3-2008/. It's the "Bonus" item at the bottom. 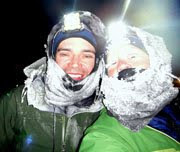 I'm an "armchair" cyclist at this point but I love your blog. Keep it up! It has a bunch of re-created Alaska historical pictures. I just found the USGS archive of photos for my town and it's very similar in that tourism has taken over. Thank goodness the mountains are still here, too. That's wonderful...thanks for sharing the pics. Oh no Oh no Oh no... there is a small patch on that mountain without snow. Global Warming must be true! Oh woe is me. Uhhhhhhhhh right. Great comparison pics tho, could be a new calling. Enjoy your writing but that background image kills my eyes trying to read dark text over it. I find it interesting that the snow pattern in the mountain crevices are nearly the same. That is crazy! It is nice to think that some things never change.